The Beach movie location on Phi Phi Island is celebrated by all lovers of dramatic beauty and lovers of the Hollywood A-lister Leonardo Di Caprio. Although the book and movie "The Beach" was set on the east coast of Thailand around Koh Samui and Koh Phangan the actual movie location of "The Beach" is Maya Bay on Phi Phi Ley island. There was no other location like Maya Bay for "The Beach" movie near the story line but Phi Phi Ley on Phi Phi Island, which is on the west coast in the Andaman sea, couldn't have been scripted better. Maya Bay is a 3 sided lagoon like inlet with steep cliffs a wide entrance and a stunning tropical sea scape. It also has three stunning beaches of which the largest is the most famous. It was here that the film crew took over, added full height coconut trees and palms and converted the beachfront to the camp of the wayward travellers who had stumbled on the secrete paradise of "The Beach". Though the movie was not a great success it put Maya Bay firmly on the list of the 10 top most beautiful beaches of the world. There are many tours that go out to view the "The Beach" movie location and you can get to view it yourself starting from Phi Phi, Phuket Phi Phi tour by Speedboat or Krabi Phi Phi tour by Speedboat. 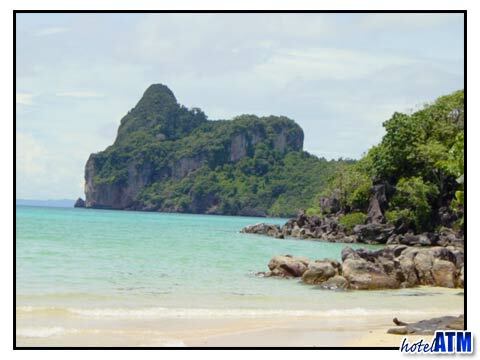 You can also look at the Phi Phi tours page and find all the differring ways to get to admire the beach. Maya Bay Camping is the only way you can stay on Maya Bay "The Beach" and the camping theme mirrors the Movie's characters who live and enjoy life in the open under simple canvass. A simple camp fire is a made and the conversation and music go on late into the night. 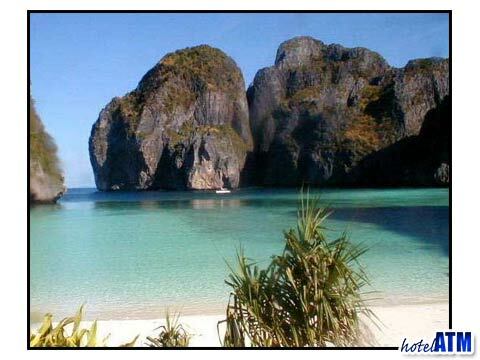 The tour includes snorkeling on Phi Phi Ley and visits all the main beauty spots of the island before reaching Maya Bay. Click here to find out more about the Maya Bay camping tour and a further article about the tour here. The nearest accommodation is in Phi Phi Don Village on Phi Phi Don. This is 15 minutes boat ride away from the Bay and is the prefect location from which to springboard a tour or visit the bay. All Phi Phi Don hotels can be found at the link and they vary from the grand Phi Phi Island Cabana Hotel to the humble 340THB guesthouse like the Harmony House.